My BBQ team, Two Little Pigs, is transitioning from a competitive team into a charitable team. For several years we have been appearing occasionally as a live auction item. In fact, we were introduced to the Spirited Table through an event like this. This year, Two Little Pigs has been a live auction item at the TwinWest Chamber of Commerce, the Alzheimer’s Association, Open Hands Foundation, and Hammer Residences of Wayzata. Winning bidders get a BBQ dinner for 30 along with lessons on competitive BBQ! Besides bringing pork ribs, pulled pork, and brisket, we try to bring a contrasting side. 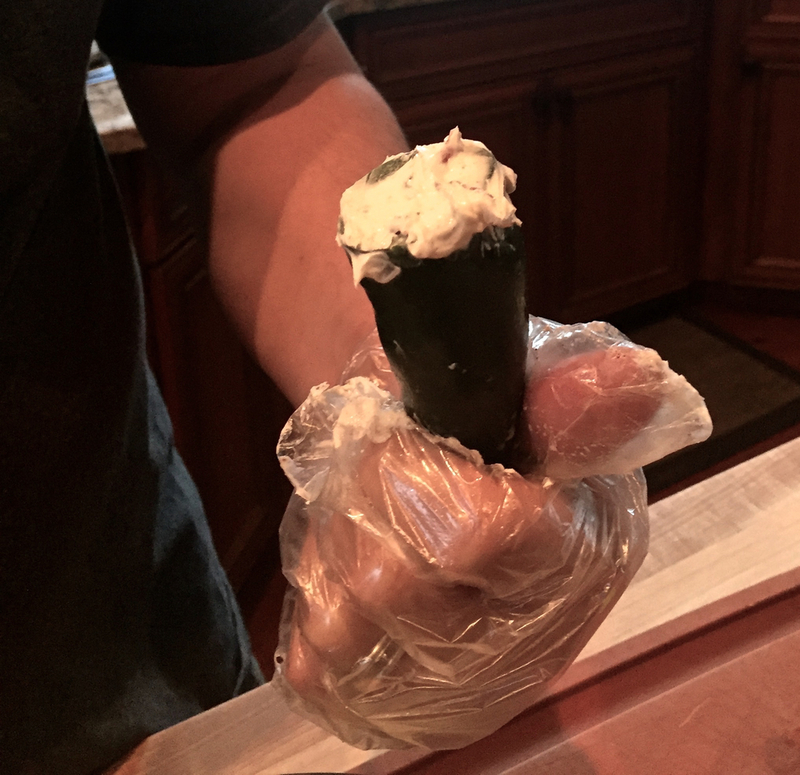 For the last charity cook, for the Alzheimer’s Association, we brought stuffed Jalapeño peppers. 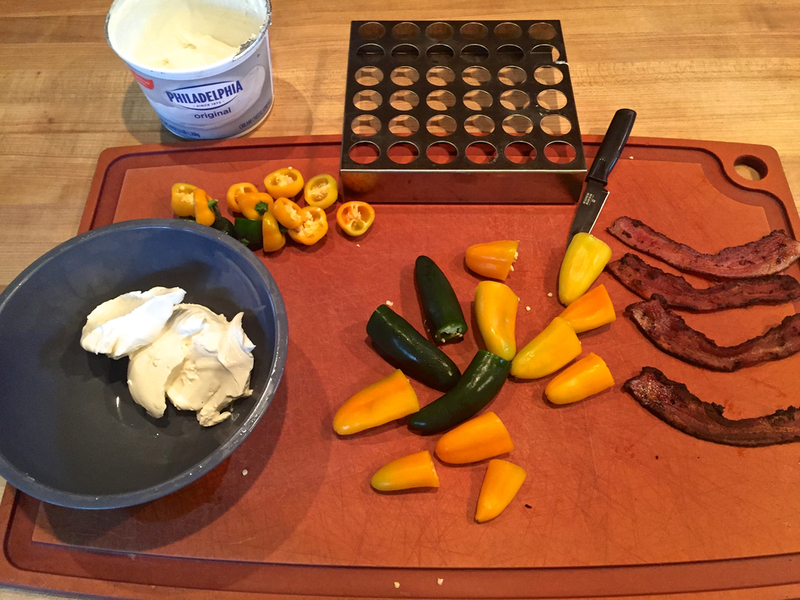 We have been trying to get more vegetables on the grill, and I we suppose this meets the bill, even though the peppers are stuffed with bacon and cream cheese! 36 Jalapeño or stuffed peppers. (Size the peppers so they will fit into but not fall through the Jalapeño rack). Cut ends off the peppers and core them. Remove all the seeds. Cook the bacon until it is crispy but not blackened. Crumble the bacon and whip into the cream cheese. 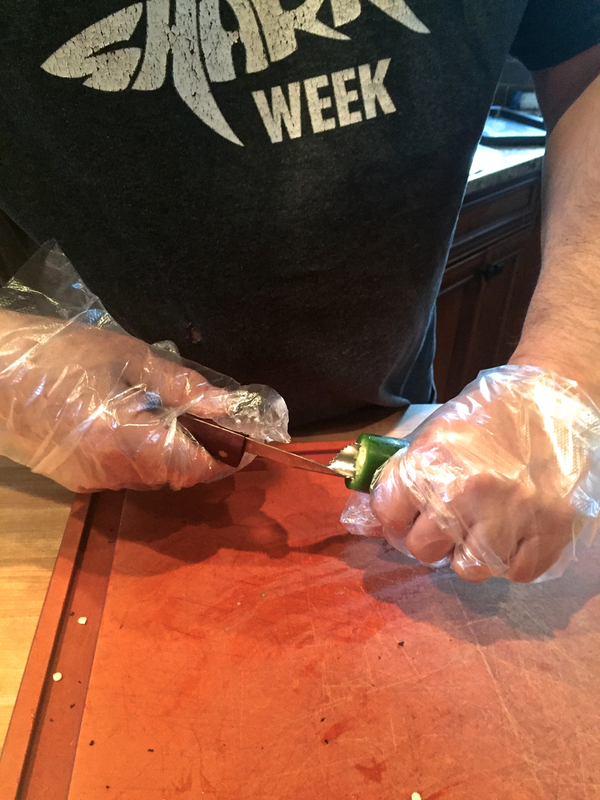 Place the peppers into a jalapeño rack (see picture). Grill on an indirect charcoal fire for about 25 minutes. Pay attention so the peppers are not blackened.